An ingredient that has really gained popularity as of recent is the cupuaçu seed butter. It has a rich content of phytosterols which is great for dry and damaged skin delivering true healing and restructuring benefits and keeping the skin hydrated. 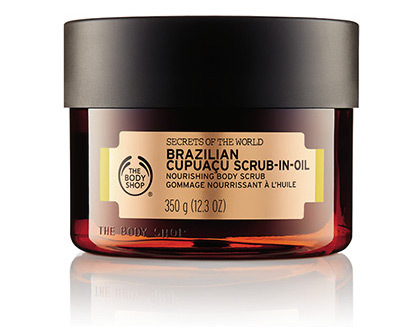 This is why we were excited to see this new scrub from the Body Shop. The Brazilian Cupuaçu scrub-in-oil ($32) is a dual-phase exfoliating scrub-in-oil. The cupuaçu seed butter is infused in oil and poured over thousands of fine salt crystals, leaving skin feeling deeply nourished, moisturised and glowing with a nutty and luxurious scent.